A few years ago, I went to an event at the Japan Society in NYC, where Satou Dai of Cowboy Bebop and Eureka Seven fame was a guest. In the lobby, they had design materials from shows he’s written for, and among the works on display was something unfamiliar which caught my eye. This anime was Battle Spirits: Shounen Toppa Bashin, a show whose character designs by Shimogasa Miho (probably best known for Demashitaa! Powerpuff Girls Z) stayed with me for years. Having finally decided to take a look, it turns out that Shounen Toppa Bashin is surprisingly strong in the categories you wouldn’t expect a trading card game-themed anime to even take into consideration, such as personal psychology and portrayals of parent-child bonds. It’s one thing to be an anime like Selector Infected Wixoss, which tries to mess with the conventions of this genre, but this very first Battle Spirits doesn’t subvert so much as challenge and uplift. The basic premise of Battle Spirits: Shounen Toppa Bashin is about as standard as it gets: kids (and adults) love a trading card game, and they somehow are able to access another dimension and battle with 3DCG monsters. They challenge each other, enter tournaments, form friendships. It basically sounds like a Yu-Gi-Oh! clone. What is notable, however, is that the character relationships in Shounen Toppa Bashin really stand out in a way that I would expect more from a Satou Jun’ichi magical girl show (Ojamajo Doremi, Fushigiboshi no Futagohime) than a TCG merchandising engine. I guess I shouldn’t be that surprised that the man responsible for the series composition of Eureka Seven would also give an impressive showing here. For example, when you see the extremely straightforward, shounen fighting spirit main character Bashin Toppa talk to his mom Hayami (both pictured above), you get a real sense that his energy and attitude come directly from how she’s raised him. Rather than ignore or deny that familial connection as is often the case with anime, the show uses it to give a real sense of personality to Toppa, to show that his simple-mindedness is also surprisingly deep. After all, what does it really mean to always look ahead, to always want to “Break through the front,” as Toppa often says? 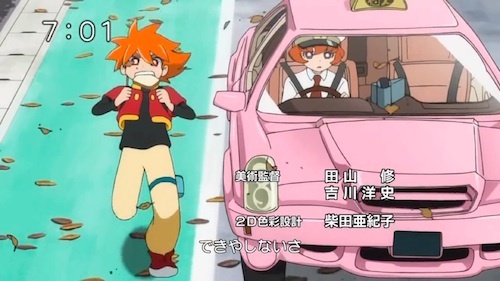 It sort of reminds me of Sei and his mother in Gundam Build Fighters, though it also doesn’t hurt that Hayami is not only a classy lady just like Rinko but a taxi driver famous for her Initial D-level driving. There are a lot of other examples too, but I’ll only mention one more. Another source of delightful interaction comes from the fact that the devious ace player Suiren is actually the popular idol My Sunshine, and Toppa’s inability to see through her disguise in spite of how much time they spend together is pretty hilarious. At the same time, however, it’s also the impetus for Suiren to open up to others and to form friendships with the rest of the main cast. The character designs by Shimogasa really shine here, which reminds me somewhat of Chousoku Henkei Gyrozetter and its own strong character designs and personalities. Speaking of character designs, they’re probably at their best when looking at the show’s ending videos. Seeing all of these characters with really simple yet vibrant personalities interact with each other in clever and entertaining ways while sporting those strong character designs just makes the show a joy to watch to the extent that it pretty much overshadows the card battling aspect of the series, which almost feels intentional given how much the show rushes through the matches. Usually, when it comes to TCG anime like Yu-Gi-Oh!, the drama is mostly focused on the card game, seeing step by step how the hero overcomes his opponents, but Shounen Toppa Bashin is different. In fact, in most episodes it generally skips a lot of turns to get straight to the climax of a match. The result is that, like Yes! Precure 5, the “fights” seem supplemental to the characters. Maybe not the best for selling the “Battle Spirits” card game, but purely as an anime I would rate it higher than most other shows in its genre. 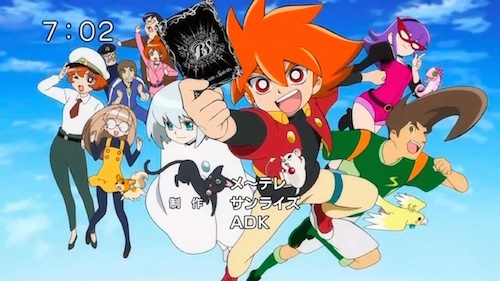 There is one TCG-relevant aspect, however, that I do find unique to Shounen Toppa Bashin, which is that the anime makes an effort to show how the characters gradually gain experience with the card game they’re playing in a way that is easy to follow. Toppa is head-strong and prefers a straightforward approach of busting through his opponent, for example, but then loses a match early on because he doesn’t take into account strategies that more directly counter his deck type. By the next battle, you see this weakness made up for to an extent, and then strengthened further in a following match. It’s a nice touch to show that the characters are learning, instead of just seeing them bust out a new deck with “all-new secret strategies!! !” (though that happens sometimes too). What also helps is that a lot that both male and female characters are considered strong players, and everyone will take games off of each other fairly regularly so there are no real “weak links” in the core group, and even those who start off that way improve over time. I’ve only watched 26 episodes so far, but I definitely look forward to seeing how the show continues to unfold. It’s the kind of show I wish more morning boys’ anime would be. This entry was posted in anime, review and tagged battle spirits, shounen toppa bashin, tcg, yu-gi-oh. Bookmark the permalink.